It is no secret that I love Duck Tape®. I have covered a cast with Duck Tape® and I have made Christmas decorations with it, and I have even made a bouquet out of it. Duck Tape® is awesome. So when I saw the opportunity to make a back to school project with Duck Tape®, I jumped at the chance. Have you seen all the awesome prints on Duck Tape® these days? Walmart should be renamed Duck Tape® Headquarters because you will find the best variety of Duck Tape® in Walmart. You can find it at numerous locations in the store. They have the regular roles of tape, but for larger projects, they now have sheets of Duck Tape®. Way cool. Both of these displays were found in the Back to School section at my store. Over in the hardware aisle, there is even more Duck Tape® goodness to choose from. With all these patterns to choose from, it’s enough to cause some serious indecision. All these fun patterns made me wish for my girl to still be in school. My back-to-schoolers are both teenager boys, though. Noah is a senior this year and Sam is a sophmore. While there are a lot of great patterns for boys, I had something different in mind. When Noah was 4, we dressed him as Superman for Halloween because he was obsessed with Superman. It started from some capes I had made for a dress up box. There was a Batman cape and a Superman cape. Noah was always Superman and Sam was always Batman. Dad + Superman = Total Cuteness. Noah’s older sister, Ryley was not happy with me obsconding with her favorite pair of purple roper boots and spray painting them red for this costume. Never mind that she could no longer wear the boots, she just was M-A-D that her little brother is wearing HER boots! His obsession hasn’t waned over the years. In first grade, he made this book. With the release of the latest movie this summer, Superman fever took on a new intensity as evidenced by the Superman hat, belt, ring, t-shirts, and hoodie he has. Since he’s got a theme going this year, I decided to run with it. Although I used a notebook that has the clear panel on the outside for sliding a custom cover into, I would recommend a binder that doesn’t have the clear plastic on it. Also, even though I used a razor outside of box cutter, do not try this at home. I was just too lazy to go find the holder. Safety first, people. Safety first! The glass is from a 5×7 frame that I had in my supplies. I started by covering the glass with a layer of red Duck Tape® on the glass. Place the sections of tape as tightly to each other as you can without overlapping them. Once you have your tape on the glass, trace the pattern onto the tape. Next, carefully cut out the pattern with the razor. If your razor is sharp, it will cut through the tape like butter. Weed out the cut sections. I didn’t photograph the next step, but carefully lift off the individual sections of tape. You can see that I have three rows of tape. I just stuck them onto the notebook cover until I needed them again. Next, put down a layer of yellow tape onto the glass. Since the glass isn’t quite wide enough for three full sections of tape, I made sure to stagger the sections so the seams did not line up for both colors. After you have the yellow layer back down, place the red symbol on top, carefully lining up the edges. See how the bottom two yellow pieces of tape join in the middle of the bottom red section? This will help make a stronger symbol when you go to put it on the notebook. Cut out around the outside edge of the red symbol and weed out all the excess yellow tape. Next, cover the notebook. This isn’t rocket science, so just do it how it makes sense to you. I recommend a slight overlap of the edges of tape. I just find it makes for a better look. 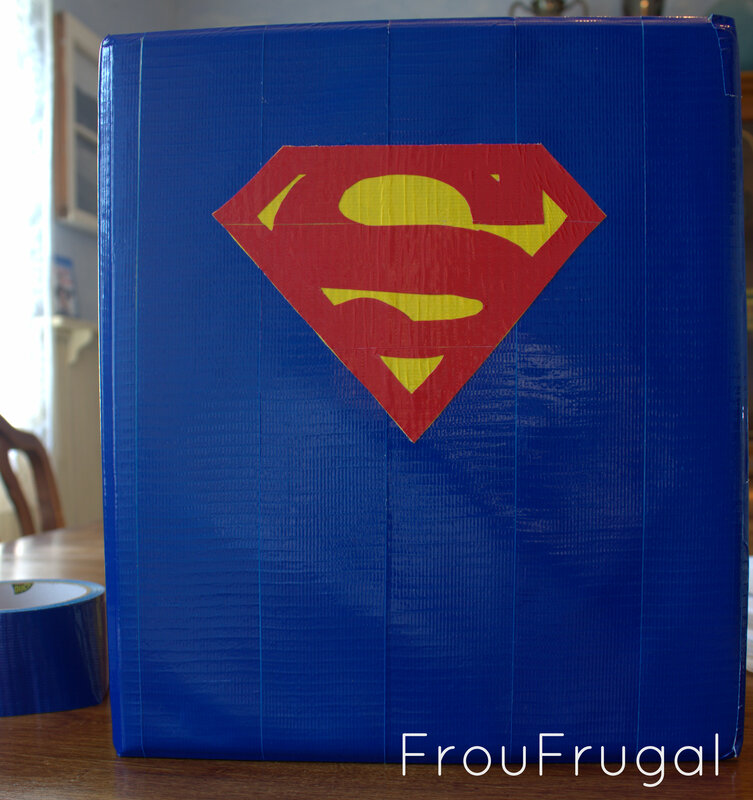 Once to book is covered in the blue tape, lift off the Superman symbol and place it on the cover of the book. There you have it. It’s a fast project and makes for a strong notebook. If you’ve ever seen a teenage boys’ end of the year notebook, you know why a little reinforcement couldn’t hurt. This book just so happens to be Noah’s Eagle Scout Project notebook. We are on trying to beat the clock and get it finished before his 18th birthday next month. This Saturday is the project. He is cleaning up a park in our community. We will be replacing the wood on some broken benches, installing some grills, fixing a gazebo, cleaning out a sandbox, and repainting some toys and covering the graffiti. Well played, First Grade Noah. Well played. You are growing up to be a super man. Noah’s not the only superhero in this house, though. Sam still loves Batman and he fills up composition notebooks with his drawings on a regular basis. Duck Tape® to the rescue! What Duck Tape® projects have you tried? Do you have any wannabe Superheroes in your life? Have you made any projects for back to school? Whatever you are doing, be sure to buy Duck Tape at Walmart for a great selection and price.